Welcome to our first giveaway! 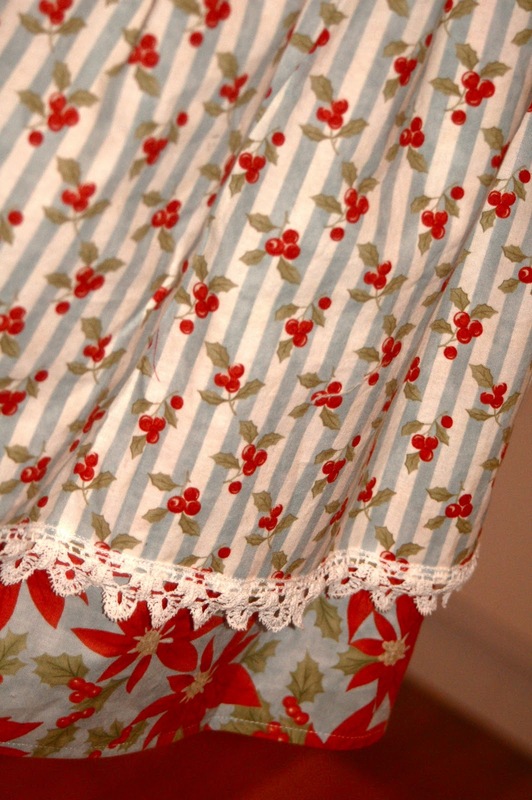 We will be giving out a vintage inspired holiday apron. 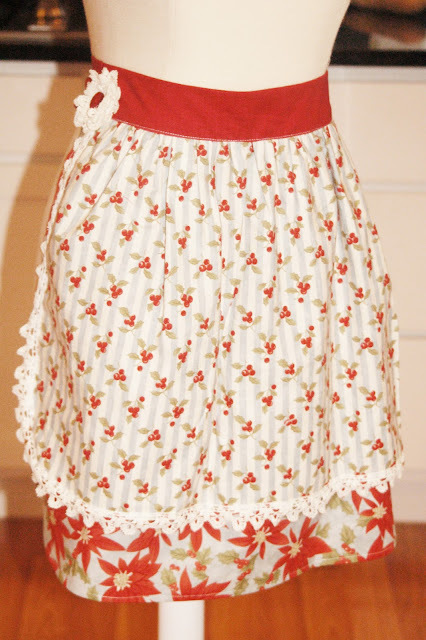 It's would be a wonderful addition to your collection of aprons or would make the perfect gift for a friend. 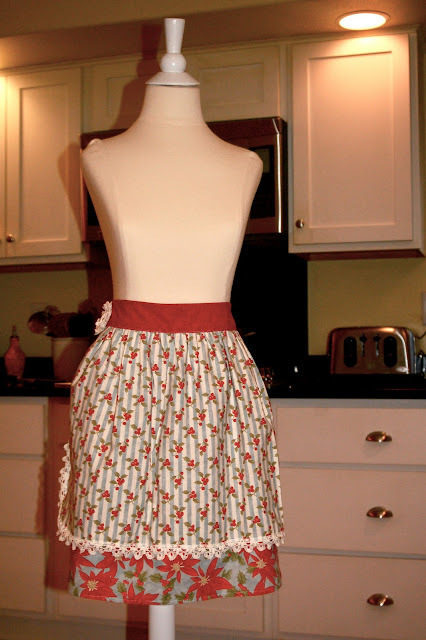 The apron is made with 3 coordinating, Moda cotton prints. It is edged with an authentic antique lace. 1 person will be selected using Random.org and will have 72 hours to claim the prize or a new winner will be chosen. I love your apron it is stunning. I think i would look very fetching in it on Christmas Day. Love your story....the things our moms teach us that we take up again when we're older...amazing and much appreciated! Love the apron. It's so precious! 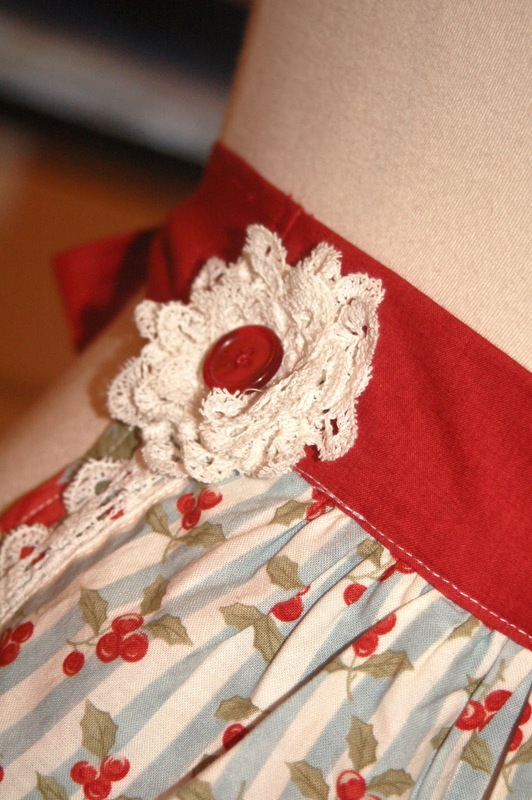 This is a beautiful apron for the Christmas season! so pretty! would love to whip up christmas cookies in this! You two ladies always out do yourselves!!! I love this apron. And I would love to wear it this season. Thanks for the chance!!! And...and...and....of course I follow your blog!!!! I think I was one of the 1st!!! Love it! Aprons are my favorite. I love sewing, too. I posted about the giveaway on my facebook. What a lovely apron. The fabrics you have used go so well together and the lace makes it even more special. I would love to win. Aprons are one of my favorite things!!! This is so cute!!!! it seems like house work is so much easier if you have a cute apron on!!!! I have been looking for an apron for my Grandma for Christmas, this would be PERFECT!!! That apron is beautiful!!! I would love to win! What a beautiful apron! Thanks for the chance!